Concerns and uncertainties on world economic activity having been gathering pace since the fall. The swift decline in world trade reflects this change in pace, moving into the red with a contraction of 0.4% in January vs. yoy growth of 4% in September 2018. This turnaround has triggered concern from the OECD and the ECB, prompting them to slice back growth projections for the euro area in particular. The very heart of this economic question is whether this shock is permanent and persistent, and in this respect, there are two interrelated questions worth noting, as well as another third aspect. The first point is the political explanation for this downturn. Trade tariffs applied by the White House have shifted the balance of trade between the US and China, leading to a swift slowdown in trade in Asia since the start of the fall and acting as the main contributing factor behind the decline in world trade as a whole. By targeting China directly, Donald Trump is actually damaging the entire region. The other aspect is the uncertainty triggered by the White House’s political choices, as doubts on trade following border tariffs are further heightened by the threat of fresh trade moves. A case in point is the German automotive sector, which could be hampered by a border tax of 25%, as the US threatens to impose tariffs on $11bn in European exports to the US in retaliation for European subsidies to Airbus. The WTO will have the final say, but there is also a further threat as Boeing is now struggling with recent problems on its 737 Max. Growth in China slowed again in 2018, with an average of 6.6% across the year vs. 6.9% in 2017. This remains a respectable figure, but it is the lowest since 1989 and 1990 as shown in the chart opposite. The 10-year average is also at a low, at around 8%. The 10% that had previously been typical of the Chinese economy is now a thing of the past, and expectations of a shift back to this trend are unrealistic. The Chinese economy is changing, setting the stage for a slower pace of growth. Slowing Chinese growth often sets off the warning bells on world growth as a whole. Having hinged on developed countries during the period after the Second World War, growth is now dependent on the situation in China, which has displayed exceptional expansion since the start of the 1990s, creating strong and long-lasting impetus for the world overall. The world growth driver is now China, rather than developed markets, and this shift is particularly vital as potential growth in developed countries has been on the wane since 2008. Right across the globe, from the US to France, growth that can be sustained in the long term while not generating permanent imbalances is weaker than before the 2007 crisis, and none of these countries can drive strong and self-sustaining growth from within their borders. Meanwhile, China managed to fuel momentum, taking over the role of developed economies – particularly the US – and benefiting the entire world economy. So China managed to set the stage for stronger growth the world over on a long-term basis, either by sparking fresh competition on the Western markets, developing relationships with other emerging countries (Asia, Africa, Latam) or attracting capital to take advantage of Chinese growth, even if the price to pay for this was the transfer of technology. According to IMF data (in current dollars terms), Chinese GDP has gone from less than 2% of world GDP in 1991 to 6% ahead of the 2007 crisis and then 16% in 2018, reflecting an astounding acceleration and putting it on a par with the euro area. Chinese GDP as measured in purchasing power parity – a more coherent price and exchange rate system than the dollar-denominated assessment – has been higher than the US figure since 2014 and above the euro area figure since 2011. More generally speaking, an increase in the weighting of China was achieved primarily at the expense of Europe and Japan, while the US maintained its strong representation. This also explains why the tension surrounding technological leadership is a Chinese-US matter and excludes Europe, which was not sufficiently involved in supporting China’s swift development. A final point worth keeping in mind is that Chinese imports equated to close to 80% of US imports in 2017. A domestic Chinese shock affecting its imports would have a similar effect to a shock on US domestic demand and hence on its imports, and the worldwide impact of a shock on Chinese growth would be closer than many would expect to the effects of a shock on US growth. French economic growth is set to step up a pace in 2017 and 2018. It will benefit from a more buoyant world context, which has been visible in the surge in world trade over recent months. It will also be driven by activity in the euro area, which is enjoying a situation that we have not seen for some time. Business trends are picking up across all countries in the zone, even Italy, and business leaders are now much more optimistic than they were a few months ago. The situation in the Eurozone is also characterized by fiscal policy that has become neutral, and monetary policy that is set to remain accommodative for a while to come. This means that for such times as inflation stays well below the ECB’s 2% target, the central bank will not change its monetary approach. To add to this, oil prices are not expected to rise sharply, so long-term rates will still stay very low. This overall context promotes risk-taking and encourages investment. 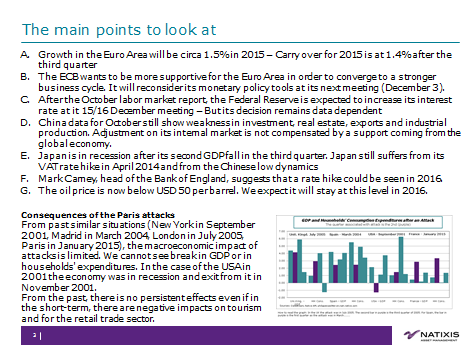 Published in French on October the 26th – Data expected this week but already published are briefly discussed. 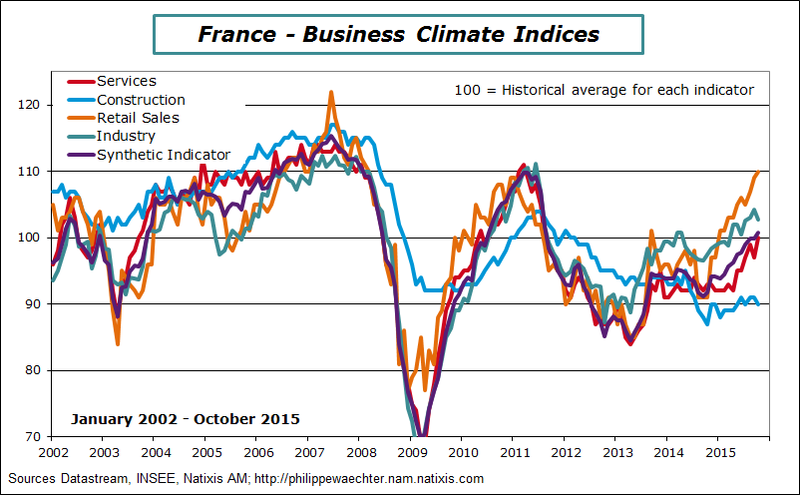 The business climate index, published by INSEE the French Statistical Institute, is above its historical average for the first time since August 2011. It shows how deep and persistent was the negative shock that has hit the French economy since this period. Looking at the different sectors, building construction is the only one being still on the weak side. Services, Industry and retail trade contribute positively to growth. 1 – The IMF has revised on the downside its forecast. In 2015 the world GDP will grow by 3.1% after 3.4% in 2014. Expectations for 2016 are marginally higher at 3.6%. Every morning I record a podcast in French (see here) on a specific topic. The text below is the translation of this morning podcast. Economic growth in the Europe has a low profile since the first quarter of 2011. It’s necessary to find a way to create a breakage in order to converge to a higher trajectory. Investment is probably the good tool for that. It can accelerate rapidly as it has been seen in the past and so can rapidly change the profile of the economy. Moreover it can incorporate innovations and technical progress in order to improve potential growth.